August 20th was supposed to be the start of a new Premier League season with a lot of promise for the squad. Looking to improve on our near miss of the title last season, fans were looking forward to check out Van Persie in action and to start off with what should have been an easy victory. Then the unthinkable occurred. We lost. Not only did we lose, but we lost to Everton. Granted, the squad was not at full strength and Van Persie was on the bench for much of the game and Rooney had one of his worst matches ever. However, but the fact remained that we lost. It was the first time that the team started the season with a loss since 2004. A few months later, things are about as they should be and much as they were last year about this time. United is atop the Premier League with a nine point lead over City and Everton is in 5th place with no realistic chance at the title. In addition, many of the holes in our squad have either resolved themselves or those that had been injury have returned to the squad. Rooney is also performing again, scoring 10 goals in the last 10 games. What does this mean for the upcoming match against Everton? First, it will not be a low scoring affair. Everton has had trouble in that department as of late, since going to a scoreless draw against Southampton. Even when they did put up three goals against Aston Villa, their defense couldn’t hold onto the lead and the team drew again. We all know United’s striking ability and their defense got a bit of a boost when injured Jonny Evans returned to the squad. Evans had been out with a hamstring injury, and injury that allowed him to work on his poker game. Evans was recently reported as doing well at poker after winning a charity poker game hosting Manchester United players. Now well rested and healed, Evans’ return ups the ante against Everton. In addition, it appears that Everton’s midfielder could be out the game with an injury. 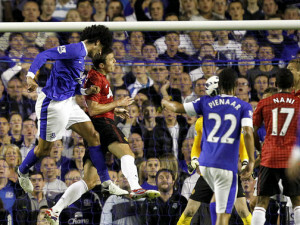 Marouane Fellaini reported for international duty and complained of hip discomfort. If this sidelines him for the game, United should be able to dismantle what is left of the defense without much effort. Ultimately, United will avenge their defeat back in August on February 10th. The Old Trafford faithful will probably see a score of 3-1 in favor of United with the Everton goal probably coming late in the game.